ADOPTED!! * Bella was surrendered to rescue when she became “too much bull terrier” for her family and the young children in the home. A typical adolescent bull terrier, Bella will push her boundaries unless she has an experienced owner who can deal with her exuberance! Bella will benefit from future training, plenty of exercise and a strong-willed owner! Bella is 15 months old, fully vetted and ready to find her new home. 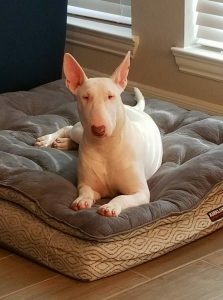 Visit our website – www.texasbullterrier.org – click on the Rescue tab and complete an online application form if you would like to add Bella to your family.